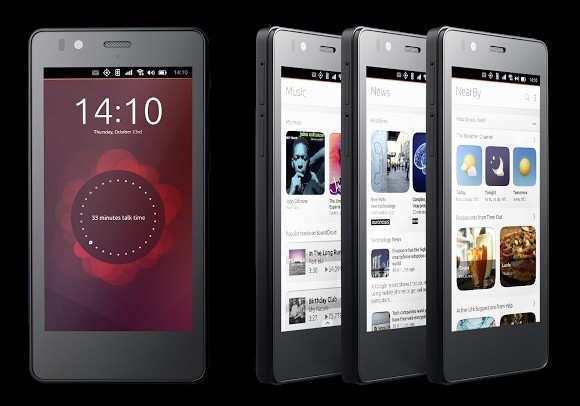 Did you ever imagine that someday Ubuntu will also be available for smartphone platform as an OS? That is what exactly happened today. BQ Aquaris E4.5, the world’s first Ubuntu phone went for sale just a few hour ago. The world’s first Ubuntu phone is manufactured by BQ, a Spanish company which used to make eBook readers, smartphone & tablets. The phone, BQ Aquaris E4.5 has been in the market for some time running Android 4.4 Kitkat, but the phone is now available with Ubuntu OS, which is totally different and the phone has been dubbed as BQ Aquaris E4.5 Ubuntu Edition. Talking about the specs, BQ Aquaris E4.5 has a 4.5 inch qHD display, as the name suggests and has a pixel density of 244ppi. BQ Aquaris E4.5 is powered by a quad-core MediaTek processor (Cortex-A7) clocked at 1.3GHz, the handset includes a Mali 400 GPU for handling the graphics, which come with a package of 1 gigs of RAM. The smartphone sports a 8-megapixel rear camera with dual-LED flash and a BSI sensor, also there is a 5MP front camera for video calling. But the cameras have got a very special feature- image stitching, which enables the user to take 13MP resolution photos wit the rear and 8MP resolution photos using the front camera. The phone has 8GB of inbuilt storage which can be expanded upto 32GB using microSD. In terms of connectivity, the phone has Wi-Fi 802.11 b/g/n, Bluetooth 4.0, 3G (HSPA+), GPS/ A-GPS, Micro-USB with OTG, and FM radio connectivity features. Now, these specs are identical to the specs which the Android variant of the phone had, but the main and only difference with that Android variant is the OS. BQ Aquaris E4.5 runs Ubuntu OS, which was under development for years, but finally British Canonical finally brought it to the smartphone with the help of BQ, a Spanish smartphone and tablet maker. The first and foremost, UI, BQ Aquaris E4.5 has Scopes UI which brings categorized items or types of items on different screens and you can switch between them anytime with just a swipe. The world’s first Ubuntu smartphone can run native apps as well as HTML apps and BQ ensured the presence of Facebook, Twitter, Dropbox, Amazon, Evernote and like these kind of essential apps on the phone right at the launch. Also, the packaging looks quite good and creative and they are giving over the ear headphones manufactured by UrbanEars which is a kind of different idea in case of smartphones. Scopes UI ditched the usual app drawer for all apps and so, you get a customized and more organized navigation for finding the right apps. Here’s the unboxing video of BQ Aquaris E4.5 Ubuntu Edition. BQ Aquaris E4.5 Ubuntu Edition is completely different from any kind of phone in terms of apps, but for now, you may get some hard corners finding the apps. BQ has announced it in Europe, but they have not made any announcement regarding when the phone will be available in other parts of the globe. However, we can expect the phone to arrive soon at the shelves, and people who are looking for a different taste are surely going to love this [phone. Now, what about the price? The BQ Aquaris E4.5 Ubuntu Edition costs EUR 169, which is approximately equal to Rs. 12,000. What do you think about the world’s first Ubuntu phone? Let us know in the comments section below.